“we have a seat for you in the canoe!” Come just as you are, He said and so do we. You will definitely fit somewhere in this paddling ohana! Whether young or more seasoned, you are welcome here. If you have never paddled before or are physically challenged, just come on down. We have recreational paddling for the entire family or competitive paddling for those who want to challenge themselves and race against others. From a ¼ mile sprint to the challenge of the 42 mile, Molokai Channel we do it all! Head Coach Cy Kalama started paddling at age 9 at Kai Oni CC for his Uncle Stew and Aunty Shirley Kalama. He won his first gold medal at age 14. After that, he paddled with Kailua Hawaiian Civic Club. He then went to Lanikai CC. In 1979, he paddled his first Molokai Channel with Lanikai. He left Lanikai and went to Kailua CC in 1984 and coached the Novice B men there until 1999. In 1999-2000 at Kailua CC, he was the head coach. Kailua won the State Championships in 1999 and was the runner up in 2000. 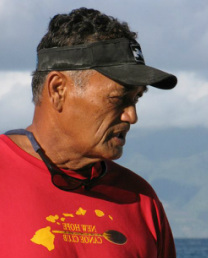 In 2000, Coach Cy Kalama was asked to start up New Hope Canoe Club with five others. He has been coaching at NHCC since then and was part of their first channel crossing for the men and women.